IRT Times Square-Grand Central Shuttle train entering Grand Central. Photo by: Zach Summer, October 2011. 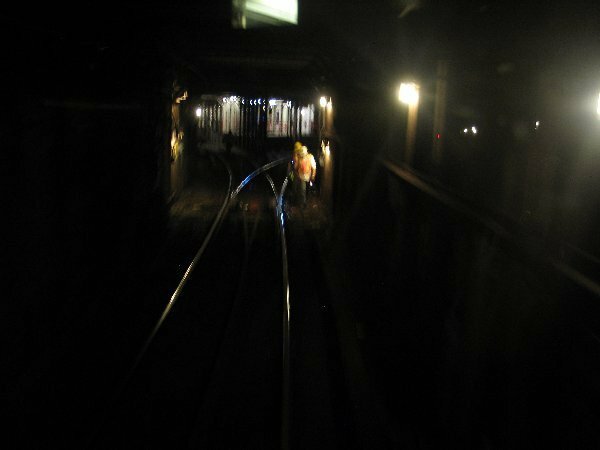 The Grand Central/Times Square shuttle stations and track are part of the Contract I Interborough subway construction which opened on October 27, 1904. 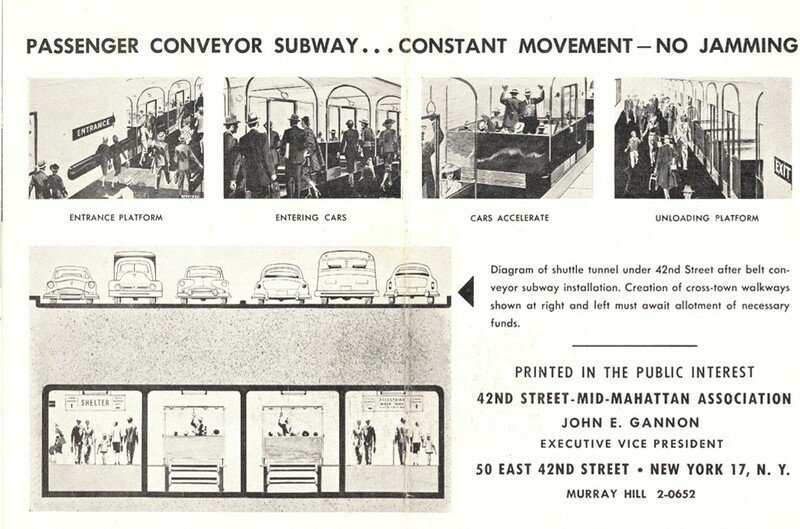 The "First Subway" was continuous from City Hall on the east side, up Broadway on the west side, using 42nd St. to get across town. When the two north-south lines were extended as part of the Dual Contracts construction (1915-1918), the crosstown connection was severed and changed into a crosstown shuttle operation. The Shuttle station at Times Square is an example of transit changing with the needs of the riders. 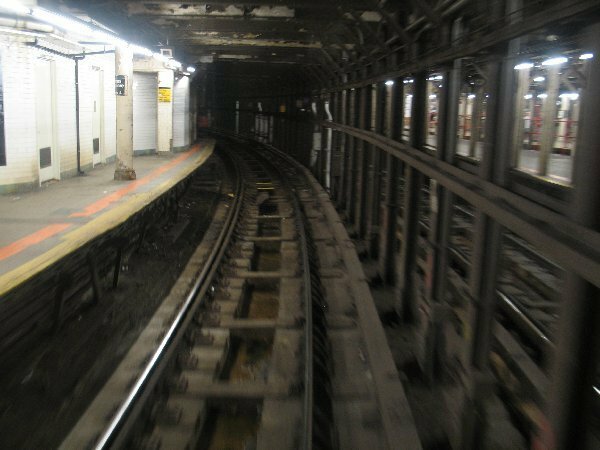 At the time the subway was built, the area was still known as Longacre Square and was not the popular destination it is today, as such the station here on the Contract I subway was merely a local stop. The original platforms are those alongside Track 1 and Track 4. When the New York Times moved to the area, Times Square was born. Load soon dictated more than a local stop. As the new extensions were built, a new station was built for the main line just south of 42nd Street. The original station, which was to become the shuttle station, had a bridge built at the west end connecting Platform 1 with Platform 4, and a new platform installed over top of the existing track #2. You can still see where track 2 was by the diagonal braced columns typical for IRT trackways. Track 4 connects to the northbound main line local track underneath a metal walkway that is removed only during midnight hours, if needed, for train swaps. 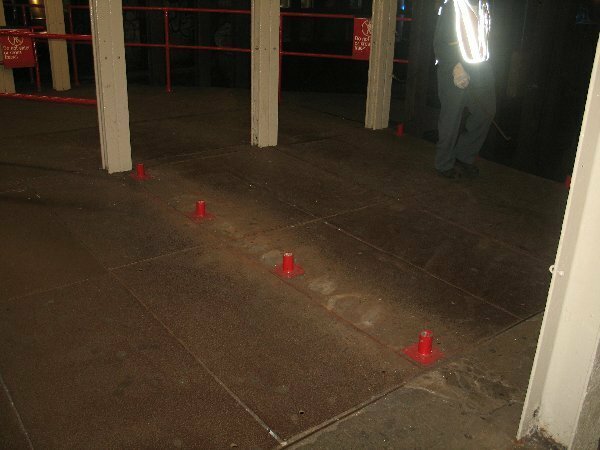 The Times Square shuttle platform has a gap filler underneath the platform in a different style than South Ferry and 14th Street. These gap fillers are solid plates rather than the slotted type and are underneath the platform. To operate the gap fillers, the train operator pushes a button on a selector board. The original configuration of the Times Square station featured an underpass between the side local platforms was accessed via a narrow stairway in mid-platform. 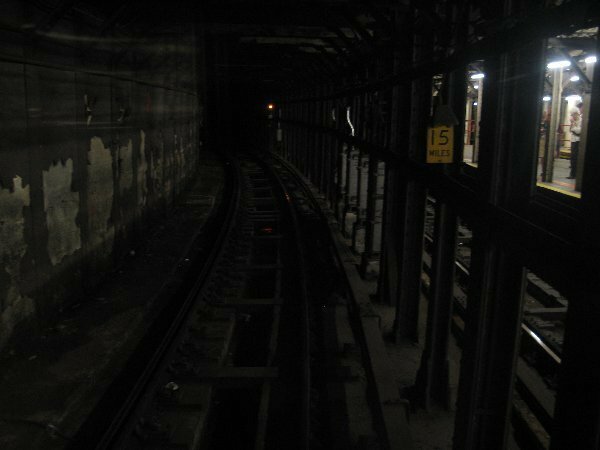 Notice that the BMT Broadway line is directly below the shuttle, and its express tracks actually spread apart to make way for the underpass, which must have been closed as surplus around the time the BMT line opened. Also, until 1948, the free transfer between the BMT station and IRT station at Times Square did not exist; each company needed its own fare. Find where the BMT paid area actually crossed under the IRT mezzanine, to reach the BMT entrance located just west of the shuttle. It's a storage space today. It can be sort of seen from the mezzanine that is downstairs across from the shuttle station. The Shuttle platform and station has recently been renovated and has a nice steam locomotive mosaic in various colors. Originally the passageway to the 4/5/6 was narrower and multi-leveled but was simplified and concrete added to form the current passageway, which is actually part of the original trackway connecting to the east side IRT main line south of the existing main line station. In fact, track 1 still connects to the main line behind the wall on the south side of this passageway. The Shuttle station in use now is the original Grand Central station on the Day One IRT. 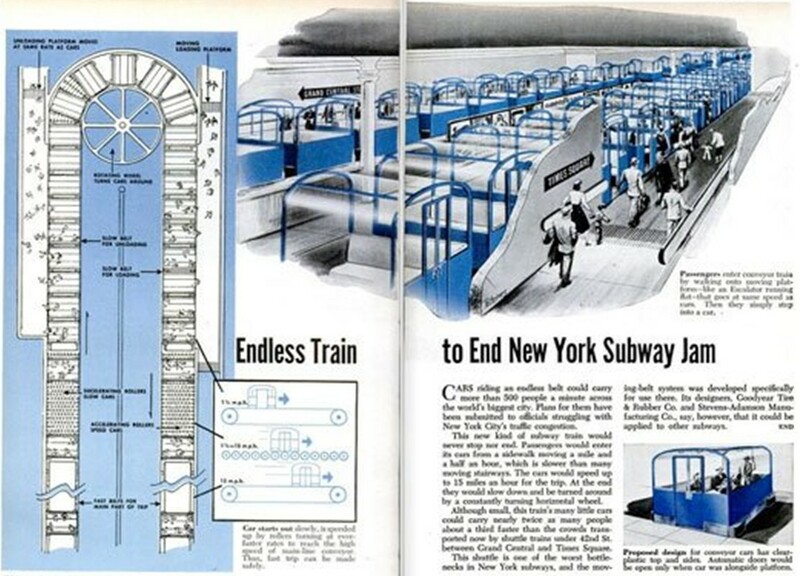 However, when the shuttle reconfiguration took place in 1918, a new Shuttle station was to be built nearer to the new Lexington Avenue station's mezzanine. 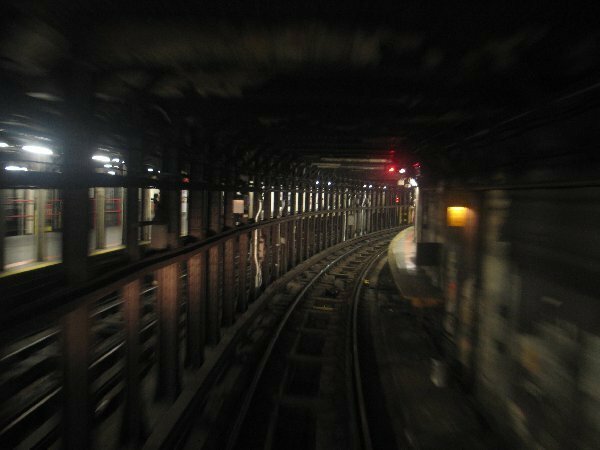 The two north side tracks under 42nd Street would continue east to the new station. Support columns were relocated at the curve just east of the old Grand Central station and a new space was excavated extending to the new Lexington Ave. station, and a center island platform between two trackways was constructed. While the station was being built, crowds using the shuttle at the old station proved to be greater than anticipated, and it was realized that two tracks and one narrow platform would never be enough. 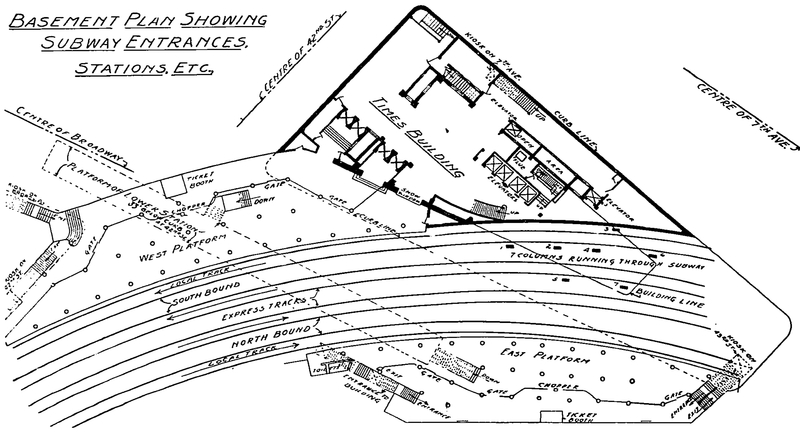 The new station idea was scrapped, and the newly built trackways were boarded over. 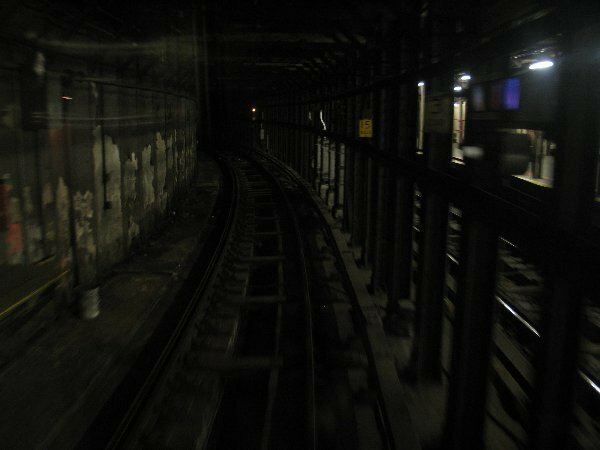 This area is still in use as the passageway from Grand Central on the Lexington line to the Shuttle. The existing concrete floor and walls date from 1964 after a fire burned the wooden flooring. As you walk through this passageway, the planned platform edges can be seen in the concrete floor. 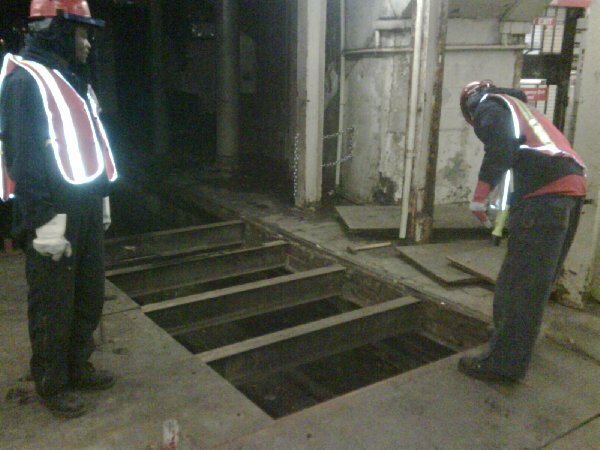 Some relative depths of stations in the Grand Central complex are as follows, +/- 10 feet. Born 1959, Died April 21st, 1964. A Biography by Mark Feinman. The Times Square - Grand Central Shuttle began as part of the first subway line of the Interborough Rapid Transit Corporation, but in 1918 when the Lexington Avenue East Side IRT and the 7th Ave/Broadway IRT subways were completed, the shuttle line took on much less of a prominent role. Since 1918, the shuttle has been used a proving ground for improvements and, sometimes, unusual innovations. In 1954, Sidney H. Bingham, then chairman of the Board of Transportation, proposed a conveyor belt system to transport a dozen people at a time in small cars continuously moving between the two stations. A contract of $3.8 million was awarded in November of that same year, but was cancelled less than a year later because it was believed to be too expensive. 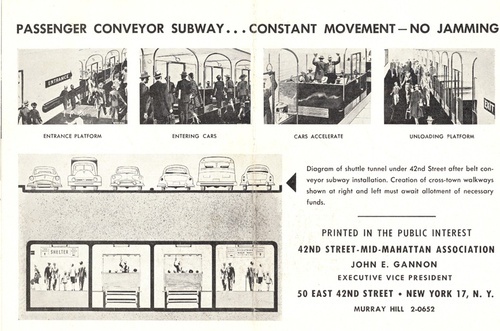 Illustrations of 1950s conveyor belt proposal. Click to enlarge. Early in 1959, the then-chairman of the NYC Transit Authority, Charles Patterson, gave a speech on the future of rapid transit. One of his prophecies was the notion of automated transit equipment without motormen or conductors. General Electric officials got wind of this speech, and pointed out to him that the technology for such a feat was already available at that time. GE proposed that they should be given the opportunity to demonstrate the technology. 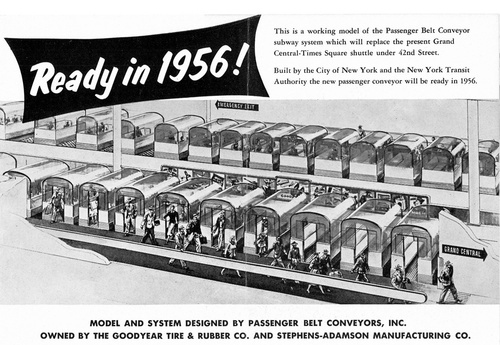 A few months later, Patterson held a meeting with GE and Westinghouse (traction), General Railway Signal (GRS) and Union Switch and Signal (US&S) (signals) and WABCO (Westinghouse Air Brake Company - brakes), and floated the idea of automating a short subway line. The Times Square - Grand Central Shuttle was selected as a candidate. At this meeting, various proposals for the automated shuttle were discussed, and an agreement was reached. 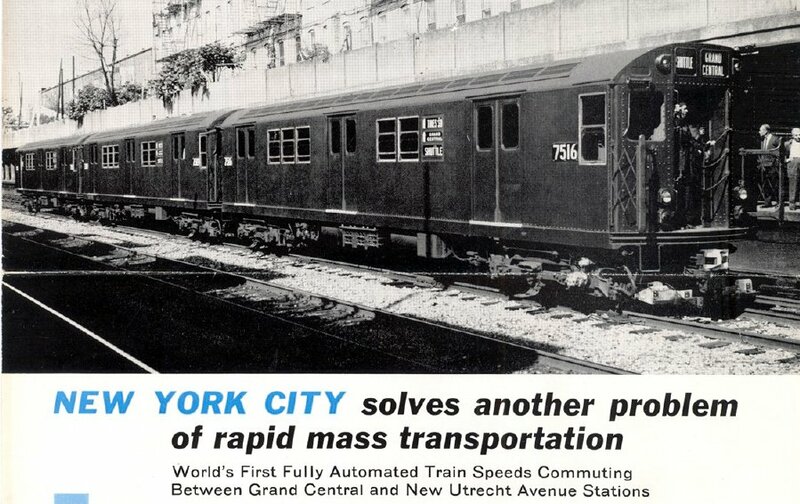 The NYCTA would supply the cars; the signal companies would provide the necessary equipment for the cars and the Shuttle, as well as the technicians to perform / oversee the work. The Sea Beach express Manhattan-bound express track, the TA's "proving ground", was once again selected for testing the automation. The area of track used was situated between New Utrecht Ave and 18th Ave, since that area of track best represented the Shuttle track and could be used without interfering with regular subway service. Test train on the Sea Beach Line. While the train is sitting at the station, the doors would remain open. Automated commands would tell the train to keep the doors open. At a prescribed interval, these commands would stop, telling the train that the doors should close. Once the doors were closed and indication was given to proceed (doors are locked), another series of commands would accelerate the train to 30mph. These commands would be sent to the train through the running rails. As long as these commands continued, the train would remain at 30mph. Approaching the other end of the shuttle line, the train would pass over an insulated rail joint, and new commands slowing the train down to 6 mph would be given. Never having been on that train, I would surmise that the braking effect was sudden and not necessarily smooth. Passing over yet another insulated rail joint (now inside the station), the 6mph commands could no longer be given to the train, causing an air brake application to stop the train within a certain tolerance. Once stopped, door open commands would be sent to the train from wayside equipment, causing the doors to open, control of the train to be changed to the opposite direction, the lighting of the appropriate side destination signs and the headlights at the (new) front of the train. The entire series of commands would be repeated in the opposite direction, ad nauseum. The decision on how much to slow the train and how quickly was based on tests done by the NYCTA using R-22 cars on the Sea Beach Line in the fall of 1959. These tests were done under manual operation, and using two different types of brake shoes - conventional (cast iron) and Cobra (special composition). The tests concluded that an accurate stop within acceptable tolerances could be made using the Cobra shoes at a speed of 6 mph. End car 7654 was outfitted for ATO by GRS. Tests continued into April as the automation system was checked and adjusted, and analysis was conducted to determine where bast to place the insulated rail joints that would be used to slow and stop the train. Further analysis was done into June of 1960. It turned out that the placement of the insulated rail joints was based on the train having new sets of brake shoes in all the cars; shoes that were broken in needed less stopping distance. It was also calculated that the automated train would take 95 seconds to travel between stops, vs. 85 seconds for a manned train. 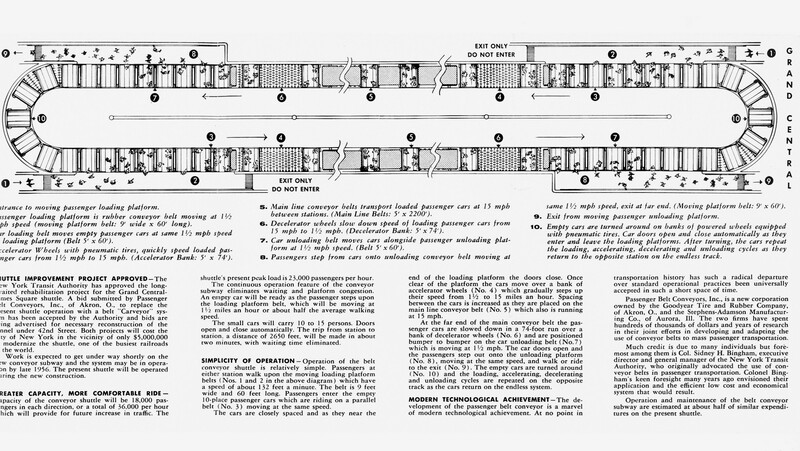 The automated train, now called SAM, was demonstrated to APTA officials in October, 1960, and to the Interstate Commerce Commission in March, 1961. 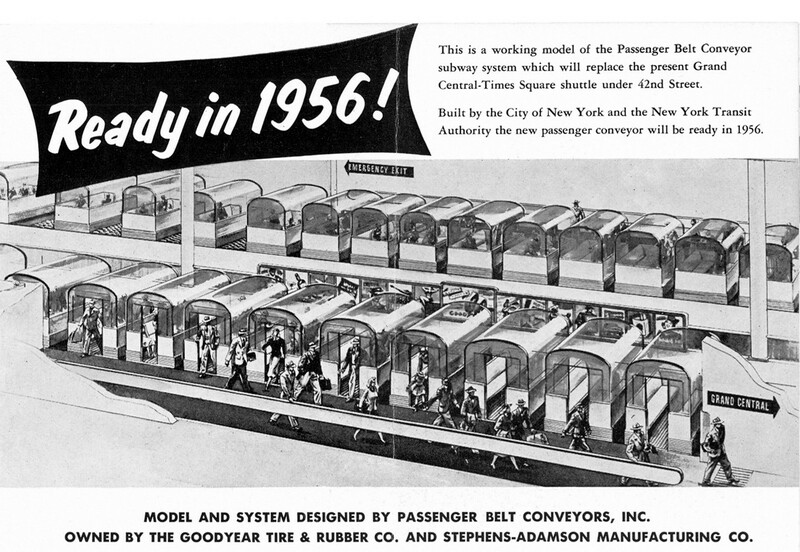 Also in March of 1961, both US&S and GRS were awarded contracts to automate the Times Square - Grand Central Shuttle train running on track 4. Equipment for the cars was delivered and installed at Coney Island Shops, and again tested on the Sea Beach test track in the summer of 1961. The system was expected to be operating by October 1st of that same year. The automated train was actually running during the fall of 1961 without passengers, running tests to ensure its safety and operation. On January 4th, 1962 at 3:17pm lasting until about 7pm, the first automated train in the US began revenue service. Although not needed, in deference to the TWU, a motorman rode the train at all times but did not operate it. The following day the train ran according to the regular shuttle timetable for track 4. Signs were posted all over track 4 indicating that the train was being automatically operated. The motorman did not ride in his cab. The public didn't seem to care (except, of course, for the railfans). The automated train ran daily from January 1962 until April 1964, and the equipment proved reliable. Some people complained about the braking; the cobra brake shoes squealed more than conventional brake shoes, giving people the perception of a rough stop. Tests revealed no difference between the automated train stopping and a manned-train stopping. On April 21st, 1964, a small but intense fire engulfed a manually operated train on track 3 and melted it away. Steel beams holding up the station roof actually buckled and 42nd Street was closed for a time. 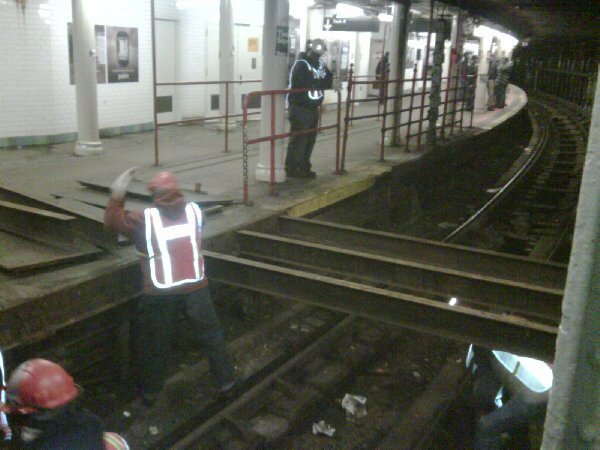 There was fear that the street would collapse into the station. R-17 Cars 6595, 6597, 6601 and R-22 car 7740 were carted away from the station as scrap. The automated train was sitting on track 4 and was significantly damaged. Ironically, the wayside / relay equipment, a short distance away from the train, was not touched at all. 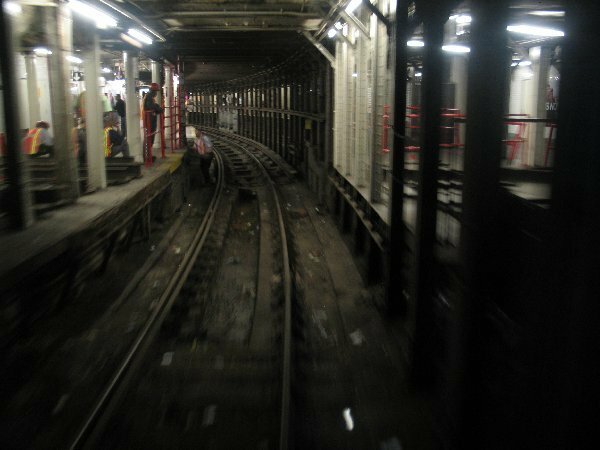 The fire started in electrical equipment in the dispatcher's office at the western end of the platform between tracks 1 and 3. There was no sign of arson or sabotage. The flames reached the laid-up train on track 3 and ignited the grease and oil under the train, and the seats inside the train. This in turn touched off the "temporary" wooden platform. The fire grew to six alarms. 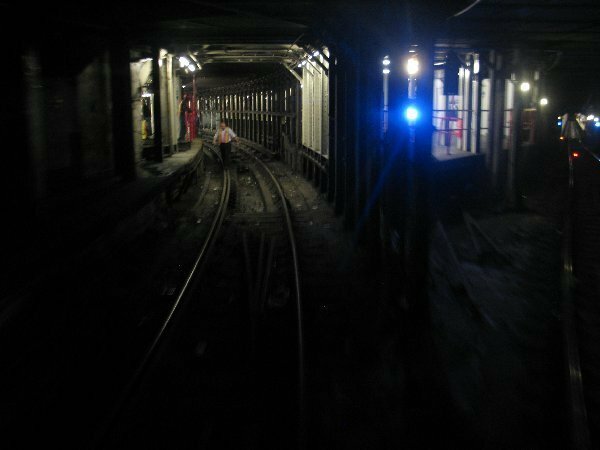 As the fire raged, the last train from Times Square, the 4:57am, arrived on track one. The motorman, Patsy De Sena, discharged the passengers from the train, then operated the train light back to Times Square. 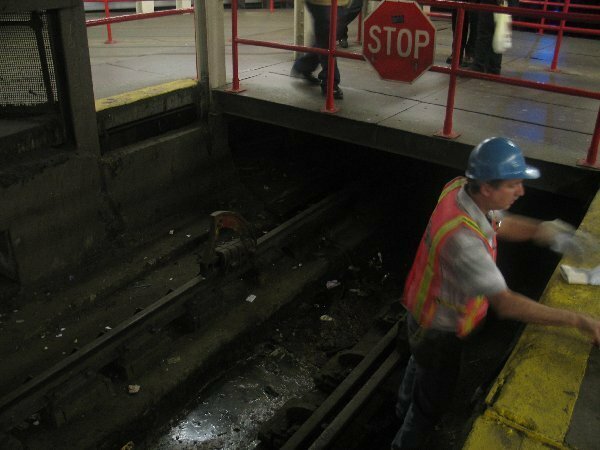 Firefighters were unable to fight the fire from the mezzanine level of the station due to the intense heat, so they were forced to drag their hoses from manhole covers on the west side of the station, and through the connecting passageway between the East Side IRT and the shuttle station. It took a number of days to restore shuttle service to normal. Today, there is no evidence that such a fire ever occurred, as both platforms are now built of cement, and the station walls have gone through two replacement tile schemes over the years, the most recent just a few years ago. Between the start of the automatic train experiment in 1959 and the shuttle fire in 1964, the TA management had changed, and the management of 1964 was not interested in running the automated train. Indeed, the TA never released figures on the cost of the automated train, only saying that the equipment suppliers had shared some of the cost. And what of the automated train, which was towed out of the station? Two cars of the train (numbers unknown) ended up being scrapped; the other became an IRT clearance car. While automatic train operation ended in NY, the successful implementation of ATO during the first 4 1/2 years of 1960 set the precedent for systems like San Francisco's BART and PATCO's Lindenwold Line. A view of the bridge and bumper at the west end of track #4 (former IRT northbound local track). The bridge is used by Shuttle passengers to and from trains on track #4 to reach the rest of the Times Square station complex. In order for trains to be swapped out of track #4, the bridge must be removed. 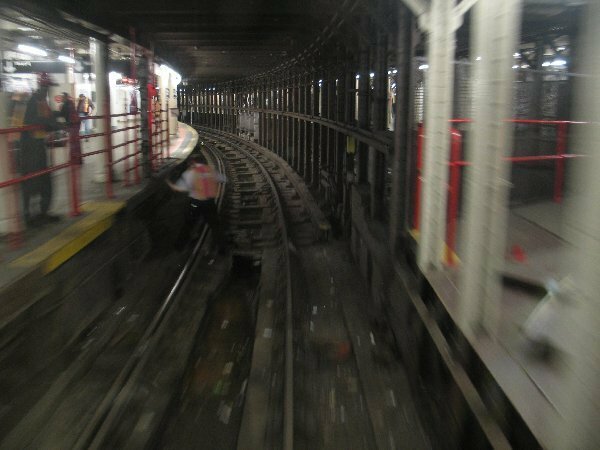 The trains can then access the northbound track of the IRT 7th Avenue Line. View of the bridge at platform level with the handrailings removed. The bridge is comprised of steel plates on top of steel I-beams. To remove the bridge, the plates must first be removed and set aside. All of the plates have been removed. Now the I-beams are lifted up and set aside. The train on track 4 enters Times Square shuttle station. A view from the rear window of the train on Track 4 at Times Square, while stopped at the platform. This train is about to be removed from the shuttle for maintenance/inspection. Wheels turning on Track 4 heading onto the main line. Passing by Track 4 platform on left side. Track 3 and platform is visible on the right. The platform for Track 3 is built over the former southbound express track, Track 2. Leaving the shuttle platforms behind. The workmen get back to work reinstalling the transfer bridge, although there will be no train on track 4 until one is brought back via this same procedure in reverse. The train has now totally cleared the platform. At the right the former trackways for tracks 3 and 2 can be seen. Just north of the normally bolted switch connecting the Shuttle Track #4 (diverging left) and the northbound IRT West Side local track (diverging right). By Mark S. Feinman, Peggy Darlington, Joe Brennan, and David Pirmann. Shuttle Track #4 photo essay by The NX.